Greater Noida; Auto Expo – The Motor Show 2018 today witnessed 8 launches and 16 unveilings from 21 auto manufacturers amongst much anticipation and exhilaration. Inaugurating the Auto Expo 2018, the largest and most iconic exposition in Asia, Shri Anant Geete, Hon’ble Minister, Ministry of Heavy Industries & Public Enterprises, Government of India, called for greater cooperation between the auto industry and the government to strengthen the growth of the sector. Maruti Suzuki’s icoinic premium hatchback Swift comes with an exciting new global design. It’s built on the 5th generation heartiest platform. Greaves Cotton announced the launch of 2 new power train solutions for last mile mobility. They also showcased BSVI ready versions of its Diesel and CNG power trains that it currently supplies to over 30 OEMs in the 3-wheeler and micro-4 wheeler segments. In the presence of renowned Cricketer, Gautam Gambhir – Pinnacle Vehicles unveiled ‘Finetza, Opisia, Magnifica and Exhibica’. Uniti Car and Bird Group announced the start of the joint market analysis in India, bringing in stylish yet affordable electric city car priced at Rs. 7,14,000 ex-showroom. Actress Sonakshi Sinha raised the glamour quotient to an all-time high today, at Auto Expo – The Motor Show 2018 when she unveiled the iconic and awe inspiring ‘DC TCA’. DC TCA’ an abbreviation for ‘Titanium, Carbon and Aluminium’, is the latest creation from Dilip Chhabria’s repertoire and is a showstopper to say the least, one amongst the many masterpieces that will create history in the niche space of Indian auto design fraternity. New start up Menza Motors India’s only bootstrap automobile manufacturing start-up unveils the first look of Electric Motorcycle- Menza Lucat which is priced at Rs. 2,79,999, ex-showroom. Starkenn Sports launched advance version of the worlds’ fastest bike Giant PROPEL ADVANCED DISC and special edition Giant TCR Advanced SL MAGILIA ROSA costing 6.9 lakhs. Additionally, Starkenn displayed a number of On Road, X road, and Off Road bikes ranging from 18,000 to 5 Lakhs. Aftek Motors, an upcoming two wheeler manufacturer, showcased its entire line-up of motorcycles in the presence of Former Indian Captain, Mohd Azharuddin. 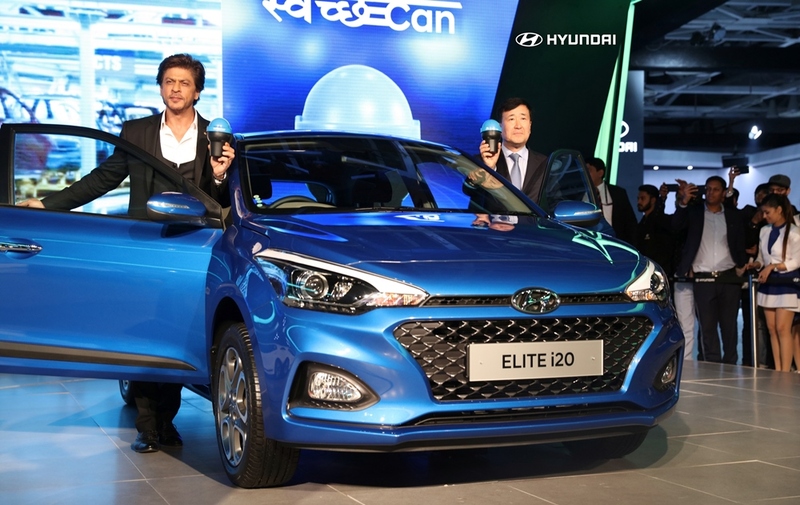 The expo was attended by renowned personalities like Bollywood Actor Shahrukh Khan at Hyundai stand supporting the government’s swatch Bharat Campaign, Actress Sonakshi Sinha, Former Indian Captain Mohammed Azhrudin & Cricketer Gautam Gambhir were also spotted at the Auto Expo. The “12th SIAM Styling & Design Conclave 2018’’, was also held on the sidelines of the Auto Expo – The Motor Show 2018 today. Experts spoke on the emerging facets of styling and design of automobiles to enhance design for sustainability. SIAM’s Styling & Design Group, has been promoting capacity building in the area of styling & design of vehicles and has been striving to develop capabilities in India. This edition is unique as it would witness the participation of 29 two/three wheelers, 15 four wheelers, 9 commercial vehicle manufacturers; unveiling around 101 vehicles. The USP of this edition would be a complete metamorphosis, a gradual transition from mere static display of vehicles to showcasing a consolidated package of ‘Entire Mobility Eco-System’, thus complementing the ambitious goal of the government to gradually move towards ‘Green Mobility’. Auto Expo 2018 is a strong step from the automobile industry highlighting the growing concern towards the environment, focusing on launching newer greener technology & products to reduce the pollution levels further, hence promoting green mobility like never before. For this edition of the Auto Expo, Special zones are being introduced to provide the visitors with a holistic experience of the industry – Motorsports, Auto Gaming Arena, #futuredecoded (VR Zone), 70 years of Indian Automobility, Exotica – a zone dedicated to vintage cars and the Application Vehicles. A mobile phone application is also available for Android and Apple users providing details about ticketing, hall layout, exhibitors, location etc. Nivedita plans to try her ‘Bhagonwali’ luck at slot machines in Vegas!